This isn't a cheap guitar and doesn´t exude the features we´ve come to expect of a £2,000 instrument, but you don´t play a Gretsch because it´s value-for-money. You play one because they look damn cool and that sound is frankly unique. Great muscular tone with Gretsch twang. The ‘ouch’ factor when it comes to the price. The Billy-Bo has a fine Firebird Red finish. The bridge is fixed, unlike earlier incarnations. The cream binding is cleanly nicely rolled into the fingerboard. If you were to combine two of the guitar's most colourful characters, it'd be hard to beat the combination of Billy Gibbons and Bo Diddley. Generations apart they may be but both are eccentric, and both know how to make their music dance. Long-time Gretsch user Bo Diddley knew how to put on a show in his day, and his Thunderbird tailfin-shaped electrics and rectangular guitars were all part of his influential act. Hey, he even came up with a beat... And Billy Gibbons is no stranger to the weirdest of guitars. So how did this latest dual signature model come about? "Some time ago, Bo gave me the guitar as a gift," says Billy. "It was during the recent ZZ Top recordings that the engineering crew and I snaked through the guitar vault searching for that 'certain something' guitar - and there it was! We didn't risk subjecting such a rare instrument to the rigours of the road, so this new reproduction model was created with some BFG mojo thrown in for good measure. It's now the main stage guitar with a groove." To prove that point, even the latest ZZ Top 'Whack Attack' tour poster features our favourite Texas triumvirate standing proudly behind the 'Billy-Bo'. "It's an unusual-looking instrument, but quite attractive to my eyes," continues Billy. "It's from Bo's genius artistic capability. Bo told me he came up with the idea in '59. That makes sense because up until then, Gretsch was using a single-coil DeArmond pickup, but following the advent of the humbucker - Seth Lover's brainchild - the Gretsch company wanted its own version, which is the twin-bobbin Filter'Tron." the late fifties, considered the electric guitar too conservative. Presumably inspired, and named, after the classic Thunderbird car, Bo's original vision is closely replicated here. The long thin body contributes to an overall length of approx 107.9cm (42.5 inches) - a Strat is closer to 956mm (38 inches) - so the Billy-Bo is clearly in the Explorer/Firebird school of 'ungainly' designs. Played seated it's comfortable enough, although, as with a Firebird, the nut seems a long stretch away. Strapped on, however, it all makes sense. It's really nicely balanced, there's no neck dive, and whether by luck or judgement ol' Bo got something right here. Although we can't see any wood due to it being covered in a Firebird Red face with black back, sides and neck, it's apparently a chambered mahogany body with an 'ultra-thin' maple laminate top. Certainly the light weight is welcome, otherwise the design could be a real shoulder-curver. Removing the three backplates doesn't tell us much more: though it's clearly substantially hollow aside from the central section under the bridge and on the bass side, where there's a back-placed rib-cage contour. The one-piece mahogany neck is fashioned to a hallmark Gretsch shape, with fairly mainstream depth of 20.6mm at the ?rst and 22.4mm at the 12th that feels a little thinner due to the slight 'V'-shaped profile. Certainly the finish quality is high, likewise the cream binding that is cleanly scraped and nicely rolled into the fingerboard. The heel is quite chunky and access to the top is not quite as good as the outline shape might suggest. The 'board itself is a nice dense brown rosewood with those distinctive thumbnail pearl markers and black dots on the cream binding so you shouldn't get lost. Mind you, the fret gauge is pretty small by modern standards - 1.85mm wide x 1.27mm high - but it's tidily installed and, with a little playing, burnishes up nicely. Gretsch's various bridges can be notorious for adjustment and, well, moving, in true vintage fashion, as the wooden 'foot' isn't fixed. Bo's original featured a Gretsch Space Control bridge with its six saddle wheels. "Well, they can be a bit cantankerous to play, for sure," muses Gibbons. "Originally they weren't even fixed to the top of the instrument, they floated and were removable. And that was a problem as far as intonation was concerned. The wheels only go left to right, they don't go backwards and forwards. Which I guess is why they made the bridge floating instead of glued. But that was one modification we decided to make. As soon as we found the sweet spot where the guitar was properly intonated, we fixed the bridge. Also, the production model comes equipped with a tune-o-matic." And while some of Brian Setzer's models use locking Sperzel tuners (and pinned bridges) here we have a set of rather basic-looking open-geared Grovers. However, looks can be deceptive, and these work smoothly. Overall, and to be expected at this price, the guitar's set-up is spot on. Gretsch has been using the highly regarded TV Jones pickups on many models in recent years. 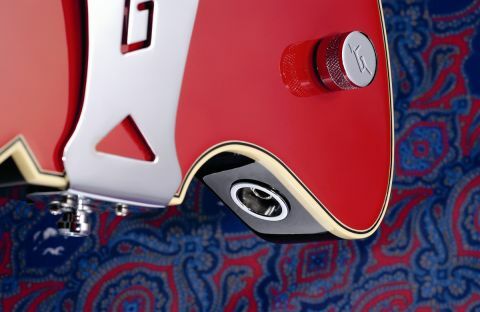 This USA-made pickup range (available in numerous styles) is known for its Gretsch reproductions and the Power'Trons fitted here are new to the range this year. "It was borne out of our desire to create a Filter'Tron-sized pickup with a strong mid-range presence and high output while still retaining the famous sparkle and bass-note clarity of our TV Classic," says TV Jones. "The tone is remarkably close to a fifties PAF humbucker, blended with a zing and twang that's all Gretsch." At the neck, we have a standard Power'Tron with a slightly wider pole-spaced Power'Tron Plus at bridge that's also a little hotter than the standard Power'Tron bridge pickup. As you can see, they're dressed up to look like classic Filter'Trons complete with partial chrome-plated covers and 12 adjustable pole pieces. There's also a high knob-count with virtually any Gretsch; and the Billy-Bo is no exception. Along with the shoulder-mounted three-way toggle, we have a master volume mounted through the black acrylic plastic pickguard, then a volume for each pickup, and finally a master tone. The output jack is neatly mounted in a circular metal housing on the inside of the treble side 'tail-fin'. You don't need the blues-based skills of Mr Gibbons or the rhythmic drive of Mr Diddley to appreciate the 'Billy-Bo'. Simply plug into a Fender-style amp, keep your gain down but wind up the power amp, add a bucket of reverb and you're taken back a few decades to that classic bright-but-not-thin twang that is hallmark Gretsch. That's not to say the 'Billy-Bo' sounds like a 6120: it doesn't. The Power'Trons dish out a more muscular voice - the bridge pickup has an almost nasal bite contrasted by the well-matched softer and darker neck humbucker. It's a true hot-rod Gretsch tone as we still get the sparkle and twang, but with enough beef to fry your preamp stage - though not excessively. Kick in a fuzztone or switch to a grittier amp setting and try out your Texas Top riffs, and we'll guarantee it'll bring a smile to your face. Again, the muscular PAF-like power sits so well with those higher harmonics; Gibbon's pinched harmonics fly from your pick and anyone who likes a bit of single-coil P-90 beef mixed in with their grit will enjoy this. At high levels, you can't help notice the chambered construction that really makes the guitar feel resonant and alive. The controls are easy to use and, for cleaner styles, mixing the pickup volumes creates some softer voices - the sound rounds out a little when you reduce the volumes. But if you wanted to use the 'Billy-Bo' in a more rock environment you might be tempted to rewire with just two controls for a more standard volume and tone set-up. While the smaller fretwire suits older fluid slides, a slightly bigger wire would help you really dig in (especially if you wanted to use heavier gauge string) but there's no doubt it all adds to the guitar's character and the sounds you produce.